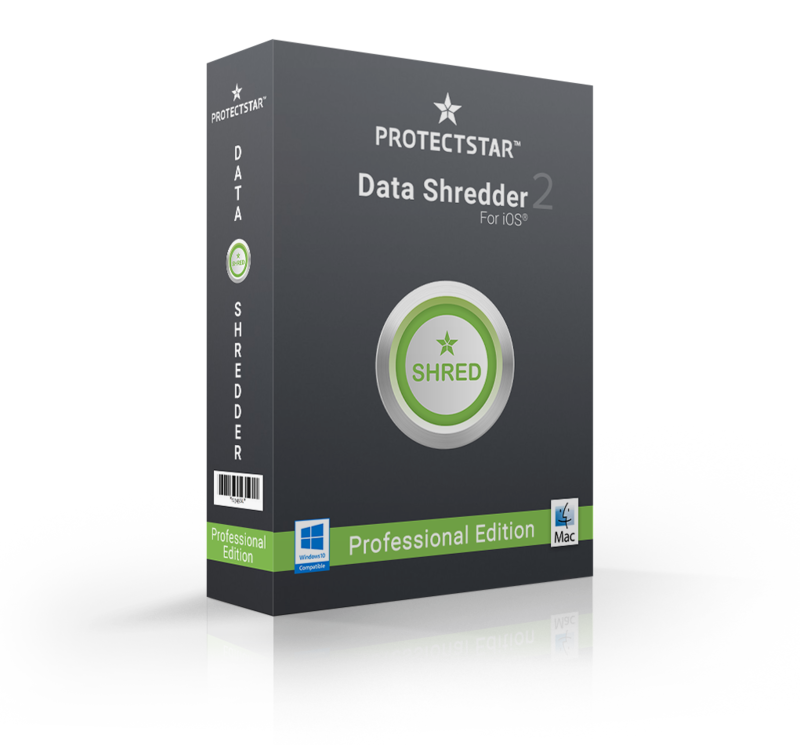 [prMac.com] Miami, Florida - ProtectStar today is proud to release the new update and immediate availability of Data Shredder for iOS 2.0 their data shredding utility that easily shreds data on any iPhone, iPad, or iPod touch. Anyone can simply connect their iOS device to their Mac or Windows computer, and efficiently erase, clean or overwrite all data from the device. The new iPhone 8 will be probably announced on September 12 and a great number of Apple fans will immediately purchase the current all-round hardware. But what to do with the old iPhone model? It is often given away or sold. The problem: even though the devices are small, they often contain a staggering amount of personal data. Photos, videos, appointments, addresses, e-mails with sensitive content, internet links as well as private records from app store downloads. Before you sell your iPhone you'll need to make sure that all your personal files on it have been blitzed beyond recovery, without a trace. It's simple to restore supposedly deleted files from the memory on your device. Data Shredder for iOS 2.0 uses data shredding techniques that go beyond international standards set by state and military organizations for secure data deletion. Data Shredder's data erasing algorithms have been analyzed by government authorities and independent security organizations to ensure the app does exactly as advertised, destroy all personal data on the device beyond any hope of recovery. "When a user deletes personal files such as photos and videos from their device, they may think they're gone for good. The truth is, they can be recovered using any one of a number of utilities for macOS or Windows. Those files aren't gone until that storage space is overwritten using secure deletion algorithms," says Chris Bohn, CEO of ProtectStar. "However, in just some simple steps, Data Shredder for iOS can securely delete the freespace using patented security standards, making it impossible to recover any deleted data." The new integrated secure cleaning module with its innovative search and collection algorithm was designed specifically to detect and effectively clean up useless temporary junk data, caches, log files and more. It not only brings back valuable storage space to the mobile device, it also ensures a performance tuning just like having a new device. The new secure cleaning module does not simply remove temporary data, it is able to safely wipe those files by using the ISM 6.2.92 deletion procedure certified by the Australian Ministry of Defense. Detailed deletion and cleaning reports provide users an evidence of deletion and cleaned data. Data Shredder for iOS is available in two versions, the Professional Edition offers 11 different data shredding methods, completely wiping all freespace and overwriting the storage area, to completely shred all of the stored data. Data Shredder Military Edition offers 18 erasing methods in total, while also offering an integrated file explorer. Data Shredder for iOS Professional uses certified deletion algorithms, including: DoD 5220.22-M ECE, Peter Gutmann, DoD 5220.22-M, HMG Infosec No.5, German BSI-2011-VS, US Army AR380-19 and more. Data Shredder for iOS Military Edition uses those same algorithms, plus makes use of enhanced military deletion methods like NATO standard, US Navy NAVSO P-5239-26 (MFM & RLL), USAF AFSSI-5020, German BSI TL-03423 and CSEC ITSG-06. Data Shredder for iOS 2 Professional Edition is just $29.90 USD (or an equivalent amount in other currencies) and is available through the ProtectStar Online Shop. Data Shredder for iOS 2 Military Edition is just $49.90 USD. Review copies are available to the press upon request. Founded in 2004 by Chris Bohn, Miami, Florida-based ProtectStar Inc. was established with the single intent of offering innovative security solutions for individuals and corporations alike. The company offers a number of security-enhancing solutions for Mac, iOS, Android, and Windows users. The company currently serves over 1,000,000 satisfied customers worldwide. All Material and Software (C) Copyright 2017 ProtectStar Inc. All Rights Reserved. Apple, the Apple logo, Macintosh, Mac OS X, and macOS are registered trademarks of Apple Inc. in the U.S. and/or other countries. Other trademarks and registered trademarks may be the property of their respective owners.